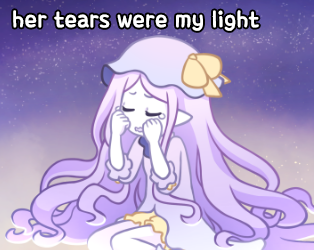 Her Tears Were My Light is a Yuri Genre Visual Novel that NomnomNami made for NaNoRenO 2016. You play as Time and befriend Space, only to encounter a mysterious force, Nil, that attempts to separate her from you. You must use your ability to travel to different points in time (implemented through unconventional use of the Ren'Py game engine's mechanics) to try to save her. The game is available for free and can be downloaded here . Big Bad: Nil, the dark entity/personification of nothingness that seeks to separate Space from Time. She isnt doing it to be evil, however, but to make Time remember her, as she is the version of Space that has burned out, making her a rare example of a non-evil main antagonist. The Big Damn Kiss: Time confesses her feelings and has one with Space and/or Nil, depending on which route you're on. Body Horror: The illustration of Nil and Space merging together. Cast Full of Gay: The cast is small and only includes girls who love girls. Cast of Personifications: All the characters are the Moe Personifications of aspects of the universe, namely time, space, and the void. They all have the forms of young women who have powers related to what they personify. Creation Myth: Told through godlike, lesbian Moe Anthropomorphisms of time and space, as well as nothingness. Cry Cute: Space cries to create stars and make herself feel less lonely, which Time finds endearing but also troubling. Dark Is Not Evil: Nil, despite being the antagonist, is actually a rare non-evil Big Bad, as she isn't messing with reality to be evil. She's upset that Time has lost her memories of her and is becoming attracted to Space, and Nil wants to be happy with her again. Exotic Eye Designs: Space has eyes filled with stars. Gameplay and Story Integration: You would normally only use the rewind button in other visual novels to re-read some text that you missed, but here, rewinding is explicitly one of Time's powers. Going back and progressing through the same conversation again with new information can lead to a different outcome. The same goes for reloading from a save point or even restarting the game from the beginning. Golden Ending: The true ending, naturally. Refusing to forget or let go of either part of Nil and Space, Time promises Nil to rewind back to the beginning, but to seek Nil out first rather than beeline straight for Space as she had done previously. Having done so, the two reconcile, share a kiss, and then go to seek out Space together. "Groundhog Day" Loop: One that exploits the rollback and persistent data mechanics of the Ren'Py game engine. He Knows About Timed Hits: The first time you are required to use Time's rewinding powers, Time will remind you that there is a button that lets you do so. Interface Screw: Nil's powers can prevent Time from rewinding. In other words, your mouse wheel and the "Rewind" button become useless, and you are forced to try other options. Leitmotif: The soundtrack has a character theme for Space and another one for Nil. The lower part from Space's theme returns at the end of the happy ending theme. Love Theme: There's also music that plays when when Time kisses either Space or Nil (during the true ending). Literal Split Personality: Space is the cast-off light from Nil, making them two halves of the same whole. Interestingly, the true ending is not about re-merging the two, but rather helping the two to co-exist with Time. Aborted Declaration of Love: One possible option when Time is trying to sort out her feelings for Space. Anguished Declaration of Love: Another possible option. Moe Anthropomorphism: Time and space plus nothingness as cute girls doing cute and not so cute things. Multiple Endings: Two normal endings, a true ending, and several different Non-Standard Game Overs. Painting the Medium: Until you reset the timeline, the title screen background will reflect which ending you most recently achieved. No ending: a dark but starry background since Space is out there crying and making stars. Space's ending: a white background since Nil goes away and stops bothering Time and Space. Nil's ending: a black background since Nil eliminates Space. True ending: a starry background with a dark upper half representing Nil and a bright lower half representing Space. Polyamory: Implied by the true ending. After sharing a kiss with Space, and Nil subsequently being chased off, Time instead chooses to follow after her to get the truth of what's going on. Nil explains their history, and Time realizes she loves both Nil and Space and doesn't want to lose or forget either of them. As proof of her devotion, Nil asks Time to rewind to the beginning again, losing what she already has with Space, and seek Nil out first. Time makes the promise, and does so, telling Nil that Space will not hate her or resent her, leading to a reconciliation and The Big Damn Kiss with Nil before the two of them set out to meet Space together, suggesting all three will become lovers. Granted, Nil and Space are technically the same person. Reset Button: Time can reset the current timeline (game) anytime and start from the beginning without losing her own memories. This is a central mechanic of the game. Ripple Effect-Proof Memory: Time and Nil can retain memories across different timelines (playthroughs). Save Scumming: Time's ability allows her to do this In-Universe. She explicitly mentions "save points" in her narrations. Time Travel: Time's power, of course. Tomboy and Girly Girl: Nil and Space have this dynamic going on, being opposites of each other. Walking Spoiler: Nil, who is directly responsible for the main conflict but doesn't reveal herself right away, and is the personification of nothingness who is the Literal Split Personality of Space. Yandere: At the end of all the failed timelines, Nil absorbs Space to get her out of the way and make Time remember their past relationship together. Yin-Yang Clash: Space's very existence contradicts Nil's. In the true ending, Time's goal is to resolve the conflict between them without letting one of them disappear. You Can't Thwart Stage One: You are required to fail at saving Space from Nil and reset the timeline several times, with both you and Nil retaining memories of these events, before you can hear Nil's side of the story and start making better decisions. Yuri Genre: A hallmark of NomnomNami's games.